Learn on an easy-to-sail 17-foot WindRider Trimaran sailboat. The WindRider 17 is very stable and forgiving beach-launched sailboat, rigged with both a mainsail and a jib. 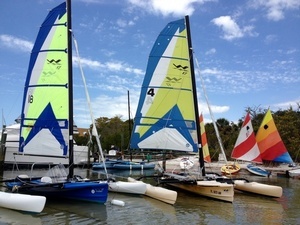 I also give lessons on the classic single-sail 14-foot Sunfish and the faster Laser sailboats (see photos on this page). 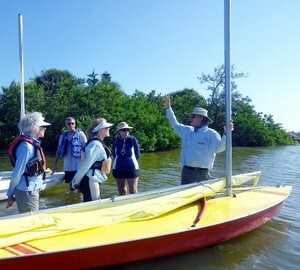 Lessons are given at Bimini Bay Sailing on Anna Maria Island, minutes away from Bradenton, Sarasota, and Longboat Key. For private lessons, contact me at WintersFJ@gmail.com and I will call you back quickly. Floyd Jay Winters is a career instructor and coach, with multiple American Sailing Association certifications, in addition to multiple United States Power Squadron certifications. Captain Jay presents the small sailboat material covered in this manual in a friendly and easy-to-understand way. This how-to-sail eBook uses many helpful teaching methods, such as mnemonics and association memory techniques, to help you learn and remember sailing terms and understand sailing concepts and maneuvers. Definitions are clear and concise and are often accompanied	by common synonyms to further facilitate learning. Learn how to sail or improve your sailing skills. Download this 100-page PDF eBook sailing tutorial to your desktop PC, your tablet or your smartphone! Then conveniently, access each chapter of this sailboat tutorial through hyperlinks from the Table of Contents, covering such subjects as parts of a sailboat, rigging, tacking, jibing, points of sail, anchoring, docking, safety tips, and many other sailing topics. This eBook includes numerous instructional photos of Sunfish, Lasers, Optis, O'Pen Bics and many other dinghies and small sailboats. Captain Jay has taught small sailboat sailing at Bimini Bay Sailing to hundreds of students, ranging in age from as young as 7 to over 70. Most instruction is offered on 17-foot WindRider trimarans, 14-foot Sunfish and Lasers. He also teaches a Beginners Sailing course, a Sail Trim course, and America's Boating Course for the Anna Maria Island Sail and Power Squadron. Jay has sailed, crewed, and raced on all sizes of boats, ranging from the 14-foot Sunfish to 36-foot keelboats to the historic 122-foot Baltimore Clipper Schooner, the	Privateer Lynx. As an experienced author, Professor Floyd Jay Winters has had several college textbooks published by major publishers. This simple 100-page pocket-sized, how to sail manual is in common PDF eBook format and is designed to display well on full-sized desktop PCs, laptops, tablets, and smart phones for your convenience on land or water. This small sailboat eBook includes over 130 clear sailboat photos, well labeled diagrams and figures to help you learn how to sail and to make sailing a safe and enjoyable sport. This pleasant small sailboat, dinghy and pram sailing manual even includes a series of water riddles to add a little amusement to your reading. If you or your child want to learn to sail on a pram, dinghy or a small sailboat, and if you are in the Bradenton, Palmetto, Sarasota, Longboat Key, Anna Maria area, feel free to contact Captain Jay for personalized sailing lessons on either a WindRider 17 or a Sunfish or a Laser. Learn how to sail today or improve your sailing skills. The first sample 9 pages of Sailboats Made Fun and Easy, in universal PDF format, for your evaluation. Purchase the full 100-page universal PDF eBook small sailboat and dinghy manual to help you learn how to sail in a fun and simple way. Only $9.00. A great gift for a friend or family member. Answers to water riddles included. WindRider 17 Triamarans on left. and dinghy manual through Etsy. at Bimini Bay, Anna Maria Island. Minutes from Bradenton and Sarasota.